The Coast Mountains are home to public “Polar Bear” celebrations that usually see big groups of people running in and running right back out again. Here are some events to check out this season. The Vancouver Polar Bear Swim Club is one of the largest and oldest Polar Bear Clubs in the world. Its initial swim was in 1920 when a small number of hardy swimmers took the plunge into English Bay on New Year’s Day. Led by their founder, Peter Pantages, the swim has grown from around 10 swimmers in that year to the new record of 2,550 official entries set in 2014. 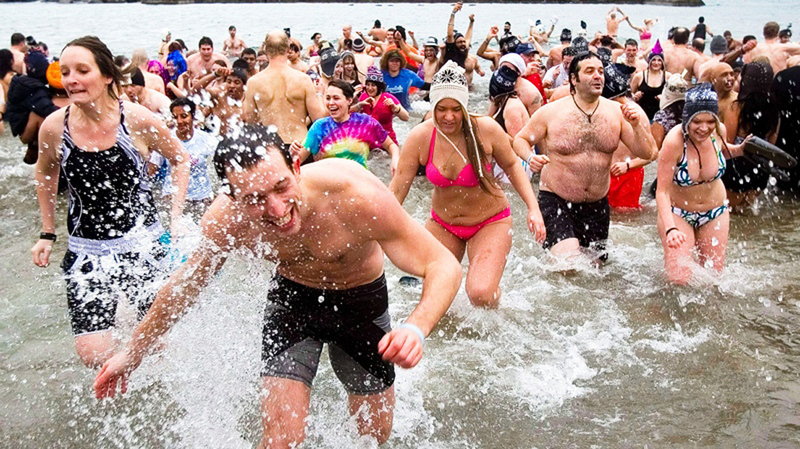 Squamish is on the ocean so why not start the New Year with a dip? Part of the Winter Carnival, so there’s a fire for after. Read about one Whistler local who takes the plunge on his own every day here.